When we were growing up, Fridays meant fish to my Catholic parents. And usually, that meant croquettes which my mom used to eat growing up in Quebec. It involved a can of salmon, mashed potatoes and some salt and pepper that was shaped into patties, covered in breadcrumbs and then fried in butter. We would eat it with a blob of mayo and some salad. I was never crazy about the croquettes but always made sure that I had the correct ratio of mayo to each patty…enough mayo to cover the croquette but not too much to make it look like frosting. I haven’t eaten canned salmon since those days, but when I spotted some “ecologically sound” wild canned salmon on sale, I decided to throw a can into my shopping basket. Originally, I was thinking croquettes but didn’t have any mashed potatoes, so I made due with what I had in the cupboard and the results turned into a pretty delicious dinner. The patties were flavourful and tangy due to the capers. These would have made pretty great salmon burgers too topped with mayo or tartar sauce and a bun, but we just ate them with some boiled red potatoes and dandelion greens. 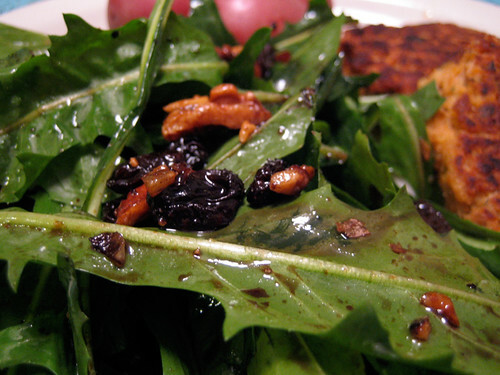 I had never cooked with dandelion greens before but when I saw some at the store I picked some up. They are definitely bitter greens and next time I think I’ll try them sauteed instead, but I also quite enjoyed this salad. The heat of the dressing didn’t wilt the leaves like I had expected them too, but the crunch of the walnuts, the sweetness of the raisins and the tang of the vinegar worked wonders with the bitter greens. Combine all ingredients, mashing everything together with a fork until well blended. Form into balls and flatten into patties. Fry in a bit of oil until golden brown on both sides. Serve with boiled potatoes and dandelion salad or eat like burgers on a bun served with tarter sauce. 1. Remove tough stems from dandelion greens, wash, dry and tear greens. Place in a large bowl and set aside. 2. In a skillet, heat olive oil, walnuts and garlic until hot, but do not let the garlic get brown. Add in raisins and stir until they are plump. Remove from heat, adding in balsamic vinegar and sugar. Whisk in salt and pepper and pour over greens, tossing until everything is well coated. Those patties look great, and also important, very simple! dandelion greens are awesome boiled and then served warm with oilve oil salt and lemon…its the way my greek grandmother makes them. I have never tried Dandelion reens, but you do make them look great, especially with those fishcakes. linda, yes, these are very very simple to prepare but delicious! enjoy. marcie, yum! sounds like a great way to prepare them. thanks! sylvie, i had never had them either, but i’m glad i gave them a try! i’ve never bought canned salmon before, i’ve always thought it was kinda weird. these look yummy though, and i love sauteed things in patty form! also, the warm dressing for the greens sounds pretty tasty. I always have canned salmon on hand – I actually prefer it to tuna. I’d love to whip up a batch of these salmon burgers. As for the dandelion greens…Marcie took the words right out of my mouth…that is the only way I ever eaten them…Greek-style – boiled, salted and with oil and lemon juice! Kind of overcooked but really tasty. It’s funny I recently tried danelion greens recently for the first time … they looked so green!… and I found them really good cooked slightly..added to soup or sauteed. Good simple eats! I love fish, too (Catholic family as well), but have never had it this way. One more new recipe to try! They look wonderful – and I have a box of panko to use up! What size is the salmon can? I thnk that in Italy the greens would be added to a salad of other greens, not eaten on their own. But I like the idea of cooking them. Looks wonderful. I will have to bookmark this recipe…and now I have a way use those dandelion greens I always see at the grocery store, but never know how to serve! We had fish fridays too and I’ve reinstituted them, mainly just because I want to eat more fish! 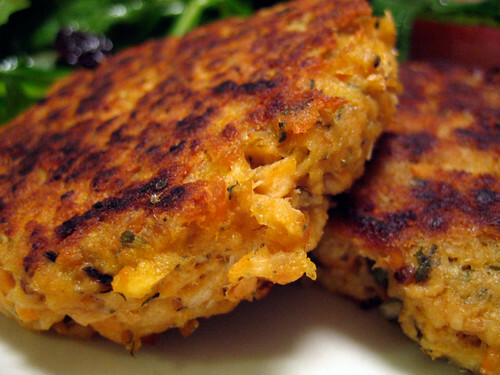 Nigella has a great salmon pattie recipe if you have leftover mashed potatoes. Will try this one as well. We eat these almost every week at our house. If I have some leftover mash, I’ll throw it in- great idea. They can be made in the oven if you want ’em a little lower on the fatty scale. Btw, patties made with the meat from various white fish taste great too. Especially with a cold beet salad on the side. michelle, me too…but it’s worth the weirdness! bijoux, well, i’ll definitely have to try dandelion greens that way next time around! yes, hag, sauteeing them is what i’ll try next! patricia, this is pretty simple to whip up on a weeknight! susan, it’s just a small sized can but you could adjust the proportions according to the size can you have on hand. Just go by feel! toffeeapple, mixing the greens is a great idea! thanks. oliver rain, the world of dandelion greens is opening up to us both! jennie, i’ll definitely try out more ways to make fish patties! mmm, cold beet salad, yum!! brilynn, i want to eat more fish too! fish fridays it is! coopernicus, i’ll take a look through my nigella books for the recipe. thanks! My mom used to make salmon croquettes when I was little, and I haven’t had them in years! Thanks for reminding me about my culinary history! 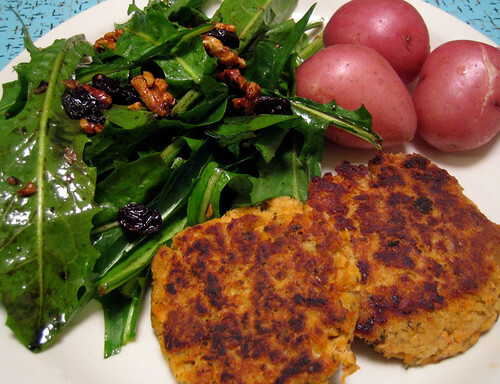 Wow, I made salmon burgers last week, and even had some dandelion greens, among other, on them. What a coinky-dink! I would totally eat that. I love me some salmon croquettes, mix a little green pepper sauce in with the mayo. I have not tried the dandy lion but I’m game. lyb, glad someone else can relate to croquettes! jessica, that is indeed quite a coincidence!! I am a little late on this comment, but those salmon patties look good and sound reall easy, thanks for the recipe! Will try these salmon cakes soon. I have a couple of cans of salmon that have been sitting in the pantry far toolong. Am enjoying your blog very much.